The 1971 horror film “Let’s Scare Jessica to Death” is the story of a woman recently released from a mental ward, who buys a house out in the country with her husband and friend to start a farm. Soon, Jessica begins to see strange things and hear voices, and eventually doesn’t know whether she’s crazy or if the place is teeming with supernatural creatures. 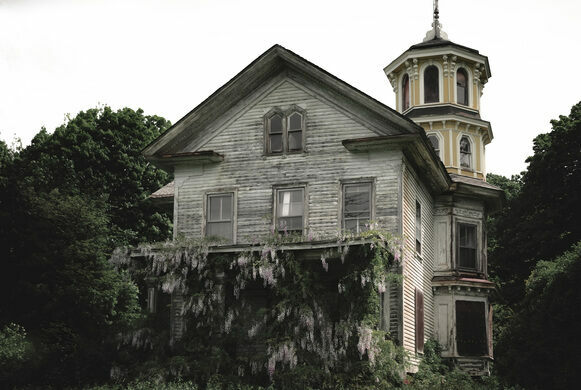 The old Bishop House that they purchase, with its unique and old-fashioned architecture, is the centerpiece of the movie and is actually located off a major highway, the Middlesex Turnpike in Old Saybrook, CT. However, it’s still extremely hidden for all that due to the fact that it’s elevated above the road and set back a bit, and is overgrown and surrounded by a few acres of vegetation. 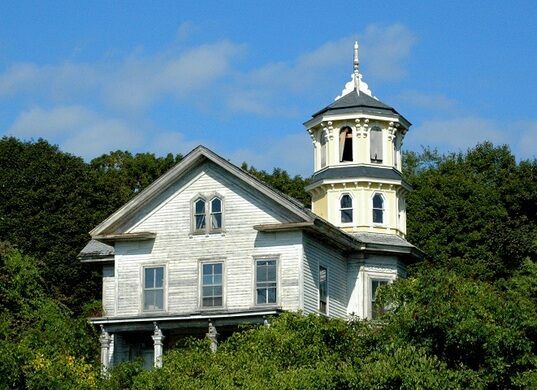 However, across the highway is a large car dealership, and from its parking lot is an excellent view of the house, with its distinctive tower that looms above the tangled trees on the little rise. The interiors of the old Bishop House were filmed elsewhere, at the E.E. Dickinson Mansion on 34 North Main Street in the nearby town of Essex.